They are brief episodes of staring; the person is not aware of what is going on and cannot respond. The episode begins and ends suddenly, usually lasting less than 10 seconds, but may last 20 seconds or longer. There is no warning and immediately afterward the person is alert and able to pay attention. The teenager may or may not be aware that a seizure has occurred. Sometimes the person is thought to be daydreaming, confused or have attention problems. Simple absence seizures are just “stares.” Complex absence seizures mean that there may also be some change in muscle activity (e.g., eye blinking or automatic hand movements), especially if the seizure lasts more than 10 seconds. Childhood absence epilepsy begins between the ages of four and eight years old with most children outgrowing the seizures in their teenage years; very few will have tonic-clonic seizures. Juvenile absence epilepsy begins in the early teen years (10-14 years old); seizures often persist into adulthood and many develop tonic-clonic seizures. Children with absence seizures have normal development and intelligence, but may have higher rates of behavioral, educational and social problems than other children. The EEG is extremely helpful in diagnosing absence seizures. In most cases, generalized spike-and-wave discharges at three-per-second or faster are recorded, especially during hyperventilation. Brain MRI is normal. Absence seizures may be confused with complex partial seizures (see below), however, absence seizures are usually shorter and are not associated with a warning (aura) or after effects such as tiredness or confusion. They are the most under-diagnosed seizure type in my experience. Myoclonic seizures occur as brief, shock-like jerks of a muscle or group of muscles. 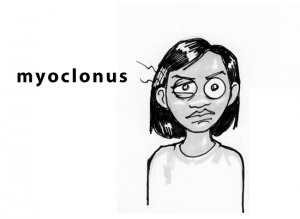 Myoclonus may occur in people who do not have epilepsy (e.g., sudden jerks when a person is falling asleep or benign nocturnal myoclonus) and in these situations is not considered epilepsy. Epileptic myoclonus usually causes abnormal movements that involve both sides of the body (e.g., neck, shoulders, and upper arms) at the same time. Myoclonic seizures are the main seizure type in teenagers with juvenile myoclonic epilepsy. In this syndrome, seizures most commonly occur within one hour after awakening. The attacks are usually well controlled with medication, which often needs to be continued throughout the person’s life. They are convulsive seizures. The person briefly stiffens on both sides, loses consciousness and falls if standing. The stiffening (tonic phase) is followed by jerking (clonic phase) of the arms and legs. The seizures usually last one to three minutes. There may be excessive saliva production, sometimes incorrectly described as “foaming” at the mouth. The tongue or cheek may be bitten. Loss of urine or, rarely, a bowel movement may occur. After the convulsion, the person is usually tired and confused for minutes to hours and often sleeps. At times the person can be agitated. Thanks for the clearly structured article. 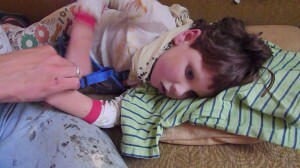 I am reading especially about petit mal seizures because my little baby seems to have them.